In the early 1900’s large amounts of Romanian Jews fled to New York. The Rumanian Committee was organized in New York City as a result of this. The Committee’s aim was to help relocate the immigrants to other cities and help them find employment. The Rumanian Committee soon became the Industrial Removal Office (IRO), under the Jewish Agricultural Society. 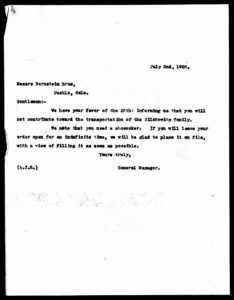 The IRO was a much broader organization and assisted any Jewish immigrant needing employment, regardless of nationality or origin. The IRO sought to help immigrants assimilate into American society, in addition to relocating them and helping them find work. 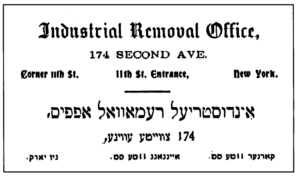 The Industrial Removal Office was committed to relocating Jewish immigrants from the squalor of the Lower East Side tenements to smaller, cleaner, and less densely populated communities across the country. They essentially established Jewish communities in places like Pueblo, Colorado and Biloxi, Mississippi across the USA. 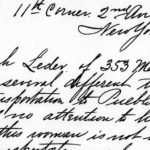 Correspondences between the IRO Director, IRO representatives, and sponsors in small communities across the United States are available online and provide insight into the emotions and logistics that went into making a better life for Jewish families stuck in the American shtetls in New York, Boston, and Philadelphia. Here is one example. The Ledder family lived in Pueblo, Colorado. 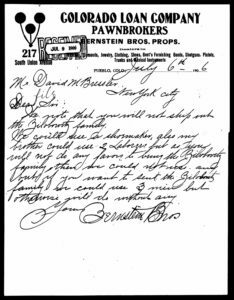 Hannah Zelbovich married into the Ledder family and wanted her siblings and mother to get out of the New York shtetl and settle in Colorado. What impresses me about this exchange is the tone of the conversation and the possible motivations behind the engagement. The tone rapidly moves from cordial into a very direct yet aggressive negotiation. 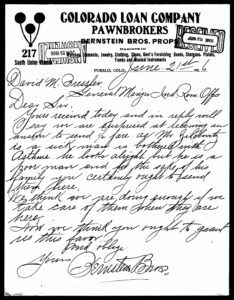 This exchange could be viewed as the Bernstein Bros. acting altruistically in wanting to help members of the Pueblo Jewish community gather their families close to them. It could also be viewed as the Bernstein Bros. vying to get skilled labor delivered to them in a way that was both inexpensive and ingratiated the labor to them. These day-to-day minutiae of the migration of families is nearly always lost in history but remain an important part of the immigration story. 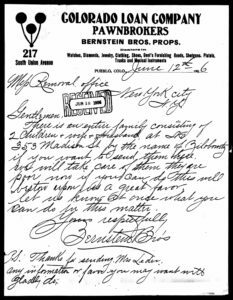 The IRO sent Hannah Ledder from New York to Pueblo, Colorado at the request of Bernstein Bros. Pawnbrokers to be with her husband Benjamin. This picture is a snapshot of a section of a letter of thanks from Bernstein Bros to the IRO General Manager. There is an entire family consisting of 2 children + wife + husband at 353 Madison St. by the name of Zilbowitz. If your want to send them here we will take care of them. They are poor now. If you can do, this will bestow upon us a great favor. Let us know at once what you can do in this matter. P.S. Thank you for sending Mrs. Leder. Any information or favor you may want will greatly do. 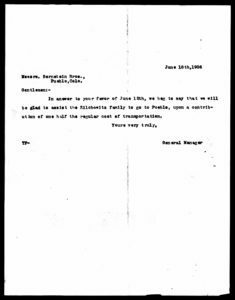 In answer to your favor of June 12, we beg to say that we will be glad to assist the Zilbowitz family to go to Pueblo, upon contribution of one half the regular cost of transportation. You received today an in reply will say we are surprised at receiving and answer to send 1/2 fair as Mr. Zilbowitz is a sick man is bothered with asthma. He looks alright but is a poor man and for the sake of his family you certainly ought to send them here. We think we are doing enough if we take care of them when they are here. Now we think you ought to grant us this favor and oblige. 217 South Union Ave, Pueblo, Colo. In answer to your favor of the 21st. inst. We regret to say that we cannot change our decision in reference to Mr. Zilbowitz and family. 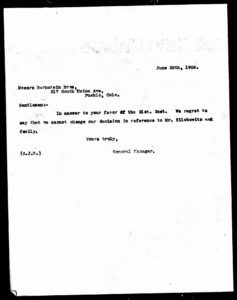 Yours received today and in reply will state we cannot afford to give one cent towards the Zilbowitz family. We think we are doing enough if we keep the whole family. Please let me know if you have a shoemaker as could use one. Messers. 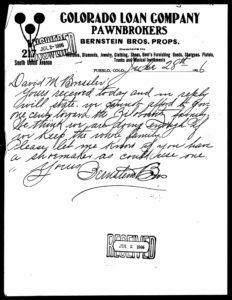 Bernstein Bros., Pueblo, Colo.
We have your favor of the 28th: informing us that you will not contribute towards the transportation of the Zilbowitz family. We note that you need a shoemaker. If you will leave your order open for an indefinite time, we will be glad to place it on file, with a view to filling it as soon as possible. We note that you will not ship out the Zilbowitz family. We could use a shoemaker. Also my brother could use 2 laborors but as you will not do any favors to bring the Zilbovitz family, then we could not use any. But if you want to send the Zilbovitz family we could use 3 men but otherwise we will do without any.